In this tutorial, I will show you how to install and configure Percona XtraDB Cluster on a CentOS 7 server. We will use Percona XtraDB Cluster 5.6 that is fully compatible to MySQL and the Percona Server. Percona is a company of MySQL and MongoDB database experts founded in 2006. Percona builds and maintains open source software for MySQL and MongoDB: the Percona Server (database server for MySQL with high availability performance enhancements), Percona XtraDB Cluster (high availability solution for MySQL cluster), Percona Server for MongoDB and other tools for managing the databases such as the Percona toolkit, Percona monitoring tools and Percona XtraBackup. 3 CentOS 7 server nodes. Replace the IP addresses with the ones that match your local network configuration. Save and exit. Firewalld is the new default firewall interface on CentOS 7. The firewall-cmd command is used to configure the firewall. We can define and configure specific groups or zones, or we can configure a firewall for services like ssh, MySQL databases, nginx/apache web server etc. In this step, we will use firewalld for the firewall configuration. We will use the 'firewall-cmd' command to open the percona server port and other ports that are needed for the cluster. To get Percona XtraDB Cluster running on the server, we need to install socat, and it's available in the epel-repository. So we need to install the Epel repository first and then install socat. Further we have to remove the mariadb-libs from the server because they conflict with the Percona XtraDB Cluster. The Epel repository and socat are installed. In this step, we will install the Percona xtradb cluster with all package dependencies. We need to add the Percona repository for the installation and then we start the Percona server and configure the root user and password for the database server. Run step 1 - 4 on all 3 CentOS server. In step 4 we've already installed Percona XtraDB Cluster and configured the root password for all Percona/Mysql server nodes. In this step, we will create a new user for SST authentication and edit the MySQL configuration my.cnf on each of server. SST (State Snapshot Transfer) is a full data copy from one server as a donor to another server as the joiner. For the SST authentication, we need to create a new user called 'sstuser' with password '[email protected]'. And for the SST method, we will use xtrabackup-v2 instead of rsync. Please use a different and secure password for your cluster! Next, edit the mysql configuration file my.cnf on each server with the vim editor. Screenshot from the percona2 server. We've configured Percona XtraDB cluster on all servers, and now we can start the server. make sure there are no error messages. If there is an error after typing to start MySQL, check the log file '/var/log/messages'. 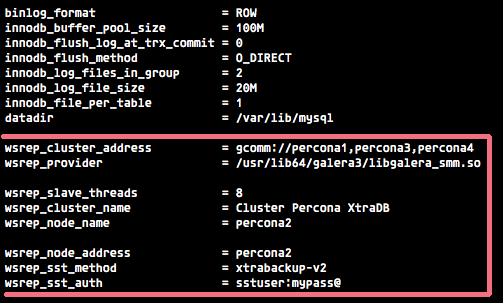 We must log in to the percona/mysql shell on each server for testing the Percona XtraDB cluster. 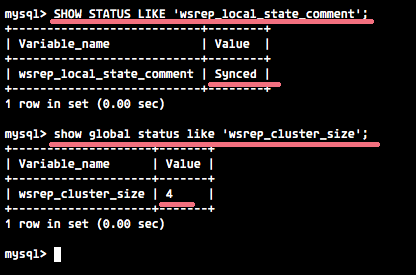 Try that command on every node, if you see "Synced" as the result, then that node is ready to handle traffic. You will get the current number of nodes in the Percona cluster. Thanks for this tutorial.But I cannot start percona2 and percona3.Whan I check my log(/var/log/messages),I can check following error.```Jan 14 01:15:50 localhost mysql-systemd: ERROR! mysqld_safe with PID 8787 has already exited: FAILUREJan 14 01:15:50 localhost systemd: mysql.service: control process exited, code=exited status=1Jan 14 01:15:50 localhost mysql-systemd: WARNING: mysql pid file /var/run/mysqld/mysqld.pid empty or not readableJan 14 01:15:50 localhost mysql-systemd: ERROR! mysql already deadJan 14 01:15:50 localhost systemd: mysql.service: control process exited, code=exited status=2Jan 14 01:15:50 localhost mysql-systemd: WARNING: mysql pid file /var/run/mysqld/mysqld.pid empty or not readable```I have no idea for this error.Do you have any opinion? This is great, but what's next?